The Chiefs have made a statement to the Hurricanes, one week out from the Super Rugby quarter-final clash. A depleted Chiefs line-up and a 63rd-minute red card to Johnny Fa'auli weren't enough of a buffer for the Hurricanes in Hamilton on Friday night, as the hosts manhandled the visitors for a 28-24 win. Fa'auli was given his marching orders for a shoulder charge on Hurricanes centre Wes Goosen that made even the home crowd wince when the replays were shown on the big screen. That just added to a Chiefs side that came into match-day knowing they'd be without Sam Cane (head), Nathan Harris (leg), and Damian McKenzie (rest), then losing Charlie Ngatai, Tyler Ardron and Jeff Thwaites before kick-off. The Hurricanes, without just Ardie Savea, Vaea Fifita and Matt Proctor from their usual starting squad, should have had a relatively comfortable time but they found just the opposite. In front of over 17,000 fans who braved the rain to see Liam Messam's final match in Hamilton, the Chiefs got out of the blocks early. With a slick surface under foot, it was no surprise to see the sides trading kicks in the opening exchanges. However, when the Chiefs decided to keep the ball in their hands it worked wonders for them. Captain for the night Brodie Retallick marked his return from injury by opening the scoring inside 10 minutes, barrelling over from close range. At the time it seemed as though it might have been the early shot to kick the Hurricanes into gear, but it didn't. The visitors continued to flounder when they had the ball in their hands and didn't look remotely like threatening. Their play became predictable, which led to an intercept try to Brad Weber in the 17th minute. Solomon Alaimalo added another and at halftime the Hurricanes faced a 21-0 deficit. The Chiefs needed to win by 23 points to secure a home quarter-final, and at that point, it looked more than likely. Needing to find some points, the visitors finally got on the board with tries in quick succession to Wes Goosen and Blade Thomson. 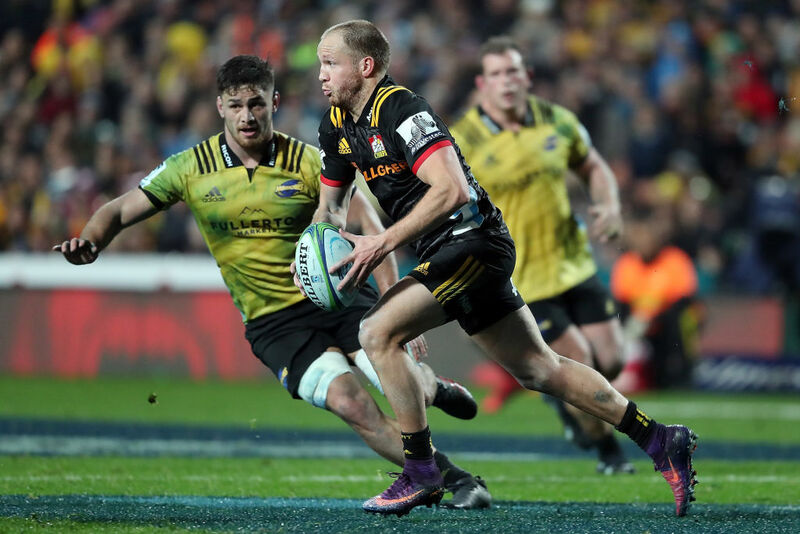 After Fa'auli was sent from the pitch, Ben May crashed over giving Beauden Barrett the chance to level the scores – however the Hurricanes' No10 missed. A late try to Mitch Karpik, converted by Marty McKenzie, stretched the gap to nine points which was enough to see the Chiefs home – despite a brain explosion gifting Julian Savea a consolation try on the buzzer. The two sides will now look ahead to a re-match in Wellington next weekend where their playoff fates will be on the line.